Should people use snowshoes on snow-covered hiking trails in the White Mountain National Forest in the winter or do without? For those who aren’t aware of it, this subject is a hotly debated topic. Every year someone will innocently ask if they should wear snowshoes and, without fail, a firestorm will ensue. Every year, that is, that people have had access to a public forum where they could debate such a thing. Nowadays that forum is largely in the form of Facebook groups. I doubt this is an age-old debate. Surely there is no such debate in, say, an Eskimo village or in the Scandinvian backcountry. So, should you? Well, if you’ve come here for a definitive answer, you won’t find it. You will find opinion, as balanced an argument as possible, maybe even insight, but no hard answers. HYOH or “hike your own hike,” as they say. You are allowed, or rather you have to, decide for yourself. In some places, like the Adirondaks, for example, they decide for you and mandate the use of snowshoes to protect the trails. But here in New Hampshire, where we “Live Free or Die,” you’re on your own. To better understand both sides, let’s hear the arguments from those who favor snowshoes and from those who oppose — if that’s even the right word to use since “don’t care” might be more apt. When considering some of the various characteristics of snowshoes and their use, what might these factions say? As you’ll discover, on some points they agree. Favor: Snowshoes limit the amount one sinks into the snow. The lighter the snow and/or the heavier the person, the bigger the snowshoes need to be. Snowshoe and walker do need to be adequately paired, but they will limit the depth one needs to step out of. And the shallower that depth, the easier it is to walk. Oppose: But they don’t provide fully positive flotation in any condition. It’s true some offer better results than others in some conditions, but realistically one would need multiple sets. Moreover, if there’s an icy crust on the snow, using snowshoes can be even more difficult because the fronts will catch under the ice layer (instead of hitting your shins). Favor: Walking in loose, unconsolidated snow is much like walking on beach sand. It moves underfoot in unpredictable ways and this makes for a tiring day. Wearing snowshoes allows one to maintain a flat, even foot for comfort and efficiency once one becomes accustomed to having them on their feet. Favor: Unless you’re training for something or love pain, the weight of snowshoes is a hard-to-appreciate characteristic. Aside from the training benefit and keeping you grounded on a windy day, the weight offers little to desire. They are best kept on your feet and you do eventually get used to them. Oppose: In winter, when your kit should contain much in the way of items to help you survive, the weight soars quickly so adding several pounds to your pack for a single purpose item can be a struggle. As noted, though, when on your feet this is less concerning. Moreover, with an already heavier pack, you may need them more… sigh. Favor: In our wildest imagination we cannot see an up-side to the bulkiness of snowshoes. Oppose: On your feet you do get used them but you will have to change up your gait more than likely. Learn to walk like a cowboy! On your pack the bulk adds to the struggle. Depending on your pack, and the design of the snowshoes and how well they nest, attaching them securely can be tough. Favor: The bottom of an aggressively-cramponed mountaineering snowshoe — and what we recommend in the White Mountain National Forest — is like something out of killer-thriller. A maw of teeth! Coupled with the stability offered, they can power you up most stuff barring hard ice. Oppose: They don’t replace crampons, though they may replace light traction (and in some cases light traction may replace them), so if you even remotely think you will encounter hard ice, you need to carry yet another heavy yet necessary item. This doesn’t, however, take away from the fact that the traction snowshoes offers is great. Favor: On angled terrain typical to the hiking trails in the Whites, the heel lifts provided on your better-quality snowshoes are a huge plus. They aid stability, traction (by centering your weight), and help ease stress on the calf muscles. And on flat terrain they make your derrière look smashing. Oppose: On flat terrain they are like walking with high heels so they have to be put down. In rolling terrain this may have to happen a lot. On some snowshoes, engaging and disengaging the heel lifts requires stooping down or clever trekking pole tricks. Ugh. Favor: Snowshoes are clunky. And the bigger and more effective they are, the clunkier they are. There are really no two ways around this. Oppose: As said by the pro crowd, above, they’re clunky. In certain terrain like the wind-scoured rock found in the alpine zone, this clunkiness may pose a hazard to the wearer making them more clumsy. To manage this it may involve stopping and changing out foot gear. This is often less than ideal, to say the least. Favor: Spending a few hundred dollars for the really great ones is a tough pill to swallow unless you’re either careless about your spending or have come to really appreciate their clear advantages. Oppose: And still, even then, the cost of really good snowshoes cannot be a positive for most people. 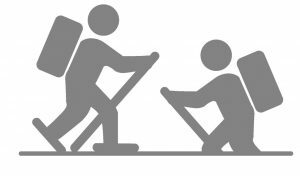 Sure it boils down to being “the cost of doing business” to winter hikers, but still. Favor: It’s sastifying to break trail with snowshoes. A group will leave behind a nice, almost groomed path (this is what barebooters will be supported by if they stay on it and if the snowpack doesn’t soften). Those who don’t wear snowshoes may punch through the existing treadway creating postholes. Oppose: Well, moose do it. There are clearly two sides to this argument yet there is a fair amount of overlap. We opt to use them much of the winter ourselves but we also hate carrying them (easier just to keep them mounted most of the time). The way we look at it is that people who don’t care about wearing snowshoes won’t care whether we wear snowshoes or not. And those who do care will be grateful we are. That said, our biggest motivation for using them most of the time is simply a matter of sound winter travel. Snowshoes ease our way in snowy conditions for the aforementioned reasons. Snowshoes facilitate, after all (to borrow a well-known book’s title), a freedom of the hills. Remember that Eskimo village and the Scandinavian backcountry? Do you think they walk around postholing, let alone hanging out on Facebook arguing about it? One could argue that if you’re not using some sort of backcountry ski gear or snowshoes, you’re working too hard and not having as much fun as you could. So does this mean that people who don’t use snowshoes are wrong? No, but they may be working harder than those who are some of the time. That said, they don’t have to deal with the weight or bulkiness. Always a silver lining, right? But aren’t the trails being ruined? Well, early- and mid-season, not so much. Snowshoers can easily bridge the gap, so to speak, even repair a trail (they are the ones who usually break the trails out in the first place). Moreover, in the upper boreal zone and above, everything fills in pretty quickly. Overnight, above treeline. In the spring, however, postholes can melt out, freeze up, then get covered over with new spring snows, and can actually then pose a hazard. Bareboots can make a spring trail, in particular, a really tough-to-walk-on mess once it freezes. To the degree that nobody will enjoy the trail. At some point, however, the warm weather wins over and we leave the snowshoes at home, crushing the monorail of remaining ice and snow into a slushy mess with our bare boots. We begin a new season leaving the dust of those nasty snowshoe wars to settle once again. We reconnect with old friends. Until the following winter when someone innocently asks The Snowshoe Question again and the war starts anew.